Standing proudly on the slopes of the River Avon, beautiful Bath was the first city in England to be designated an UNESCO World Heritage site. The gorgeous 15th century Bath Abbey, the stunning Georgian architecture, the romantic Pulteney Bridge, modeled on Florence's Ponte Vecchio, are all sights to linger on in the memory of your day. Roman Baths and Pump Rooms No tour of Bath would be complete without a visit to the famous Roman Baths that gave the city its name. 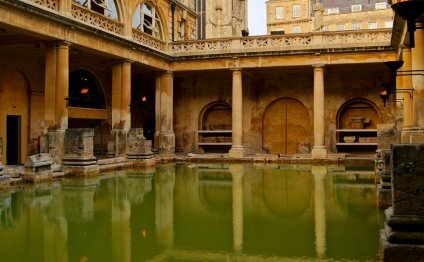 This beautifully preserved bathing complex still flows with water from Britain’s only hot spring. Marvel at the dazzling torch–lighting ceremony as dusk falls (not applicable in summer) and sip Bath’s healing waters in the Pump Room, a stunning neo–classical salon. 1 Temple Gardens is a barristers' Chambers in the Inner Temple in London, England. The canopied white stone building was designed by Sir Charles Barry, architect of the British Houses of Parliament. White City bus station serves the White City area of West London and Westfield London shopping centre.